322 pages | 101 B/W Illus. Introduction. Programme Management; Portfolio Management; Differences between programmes, portfolios and projects; Differences between UK and US terminology. Doing the Right Projects. Selecting Programmes of Change; Delivering strategic change; Levels of maturity in selecting and prioritising projects and programmes; Barriers to effective change; Benefits and the management of benefits. Doing Projects Right. 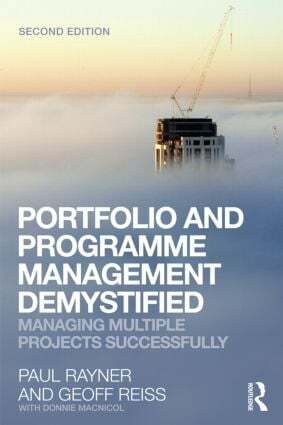 Managing a portfolio of projects; The relationship between programme manager and project manager; The relationship between portfolio manager and project manager; Managing multiple resources across multiple projects; Dealing with business as usual; Programme risk management. Roles and Relationships. Programme Management Roles and Relationships; Matrix Management; The relationship between project managers and line management. Governance. Methodologies – Managing Successful programmes, PMI Program Management Standard, PMI Portfolio Management Standard; Forms, reports and more reports. Some dangers of excessive governance. Programme and Project Offices. Roles and responsibilities; Expectations and delivery; Risks and benefits. References. Websites, other publications and sources. Geoff Reiss is Senior Architect with Program Management Group plc. He has extensive experience in the construction industry and has grown into the project management specialism over a varied career. Paul Rayner After an early career with IBM in Australia Paul Rayner began a lifelong interest in the best ways of managing large scale corporate projects. He was a Commercial Projects Manager for Cybernet Timesharing in the 70’s, and principle of Great Northern Computer Services. After gaining his MBA he joined Logica plc as a Management Consultant, where he worked until his retirement in 2011. He chaired the Association for Project Management’s Programme Management Group, wrote the APM Introduction to Programme Management, and co-authored the Gower Handbook of Programme Management (2006). He worked extraordinarily hard to improve approaches to portfolio and programme management, cheerfully giving his time to speak at events throughout the world. He was also a committed family man who took great pride in supporting the achievements of his three children. When he knew he was dying of cancer, he was determined to finish Portfolio and Programme Management Demystified, which he wanted to dedicate to them. He died, aged 64, in August 2011. Donnie MacNicol Utilising his extensive PM experience across multiple industries Donnie leads consultancy, training, facilitation and mentoring assignments for global companies and government departments in developing project and programme leadership. Donnie chaired the Association for Project Management People Specific Interest Group for 10 years to 2011, is a Visiting Fellow at Kingston Business School, an individual member of the Acumen7 professional network and Partner at Synatus.